Tommy's self-care skills are very good. It seems it comes very natural on him. I think it is because he is very observant. I realized how observant he is since he was 8 1/2 month when he discovered people and objects have shadows. I introduced brushing his gums by himself since he was a baby, then the transition to brush his teeth was smoothly. Ironically, he knew to brush his teeth before he had teeth. He brushes his teeth with my supervision and help. I don't think it won't be much different until he is about 5 years old or older. Even although he is not walking yet, nothing is stopping him of experience brushing his teeth as other toddlers of his age, which make me very proud of him. Tommy's gross motor skills are slowing down again. He seems to be more fine motor driven again, but his team is looking for ways to keep him working on his gross motor skills while he does things he enjoys such as: "Brushing his teeth". 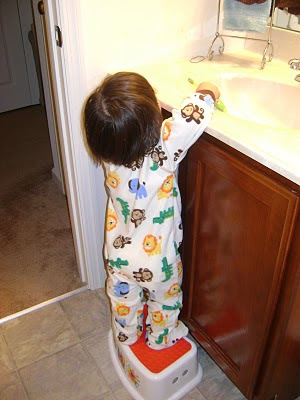 Therefore, one of his Physical Therapists recommended to use a step stool in the bathroom because he can stand up on it while he brushes his teeth. We tried this evening and he enjoyed it. He was on his tip-toes trying to look at himself in the mirror. His PT suggested to buy a step stool of 2 steps because stepping will help him to improve his balance and have more weight shifting in his hips. Meanwhile, we will use his Elmo step stool. Enjoy the photos of Tommy brushing his teeth. Oh my! Tommy is SO CUTE! 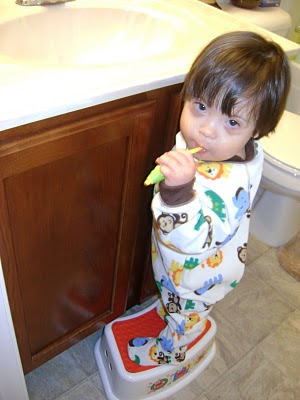 I cannot believe that he not only brushes his teeth so well but that he stands on his new and super cute stool to do it! Go Tommy GO!!! thanks for sharing your ideas, hopes and strength with us. it's so great to meet you.